The renowned Bios Urn are a magnificent addition to our range of biodegradable urns. This beatitude biodegradable urn tree was born from the desire of becoming one with mother nature after passing away, which provides peace of mind to many of our customers. The Bios tree Urn combines a loved ones ashes with the earth to help germinate a seed or tree of your choice, using the qualities from the ashes (phosphate) as a fertilizer which in turn becomes a loving memorial to your lost loved one. 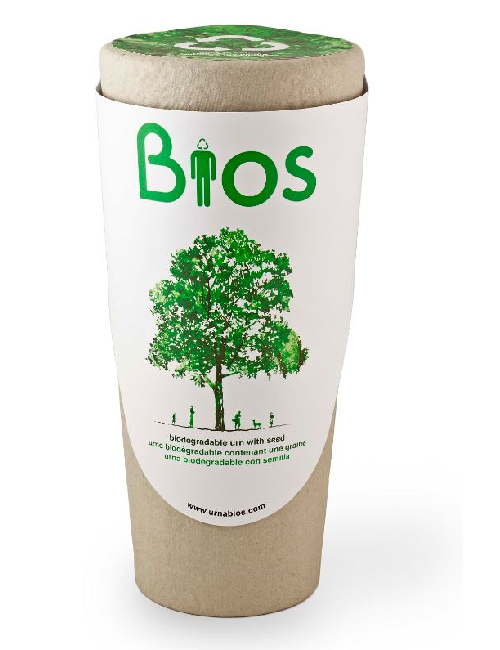 The bios urns are 100 biodegradable and made only from recyclable materials. The urn itself supports any seed you wish, so whether you want to grow a memorial tree or a garden of flowers, this bio urn will suit every need and every person. The bios urn is split into 2 compartments, the main bulk of the urn in which the remains are held and a top compartment which supports the initial growth of the plant before it combines with the ashes once stable roots are grown. Full instructions can be found below. These biodegradable urns are suitable for the burial of human ashes and pet/animal ashes, both would create a loving memory for family and friends to visit for generations. If you are planning to plant the tree away from your home, we would suggest purchasing a sapling as a pose to a seed to plant with the bio urn so that the initial care is taken care of and you are not required to water the new seed daily, this will help ensure a strong tree is grown. The Bios urn is delivered free and comes in a box which contains all necessary items and instructions for use, the tree urn has no expiration date and can be stored for as long as you need to before the need to use it arises. The whole premise of this urn to help the environment, with its simple and minimalist design the urn is extremely socially responsible, leaving no trace of its use on the environment minus a nurtured tree. Very pleased with my purchase, smooth transaction and prompt delivery, thank you.